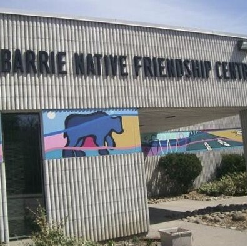 Membership Classifications at the Barrie Native Friendship Centre - Regular Membership: A regular member is any persons of Native ancestry, who is 18 years of age and older, is sympathetic with the aims and objectives of the Centre and who holds a valid membership card. Regular members are entitled to vote, hold office, and participate in the distribution of property. They shall pay annual membership dues in accordance with the guidelines established by the Board of Directors. Associate Membership: An associate member is any person who is non-native, who is 18 years of age or older and is sympathetic with the aims and objectives of the Centre. Associate members are not entitled to vote, hold office, manage the affairs or participate in the distribution of property of the Centre. They shall be entitled to notice of meetings of the membership. Junior Membership: A junior member is any person who is less than 18 years of age, is sympathetic with the aims and objectives of the Centre, and who holds a valid membership card. Junior members however created are not entitled to vote.